What is the meaning of all this? It has been forever and a day since we began (and abruptly discontinued) our coverage of the wave of flash sale wine sites that have come into the national marketplace. In that time, there have been some interesting new players to the game, and a bunch of half-assed pretenders as well. But this is America, and any business concept that gains any media traction at all- even if few players are actually profiting- finds a slew of posers and thieves peddling close facsimiles of the most visible early-to-market examples. But the realities of the intersection of wine buying (and collecting) and the flash sale model caught up quickly, and it is no longer a growing landscape. Besides those with massive personal cellars or substantial off-site professional storage, most early flash sale wine enthusiasts learned to curb their impulse buying out of spatial necessity, and the race to replace them with new users is a costly one. At this point the growth of flash sale sites has been replaced by email lists which build slower but yield a more consistent audience. But in fairness, the email based offer was the original version of the medium, led by the much lauded Garagiste, with whom I have a long time bone to pick, but that’s a story for another time. WineAccess.com – I don’t entirely understand the recent redesign, or why after many years of successful digital service, the site seems to be in beta, but I have been purchasing excellent west coast wine at lowest available prices for many years. So, I have to give them credit where it is due. While I’ve rarely, if ever, purchased European wine through them, WineAccess continues to source some of the finest, best priced, old vine wines CA has ever had to offer. Over the years, they’ve introduced me to a few of my favorites, and one can get a fairly good free education on the history of American viticulutre, and the nature of the industry, from vineyard to consumer. 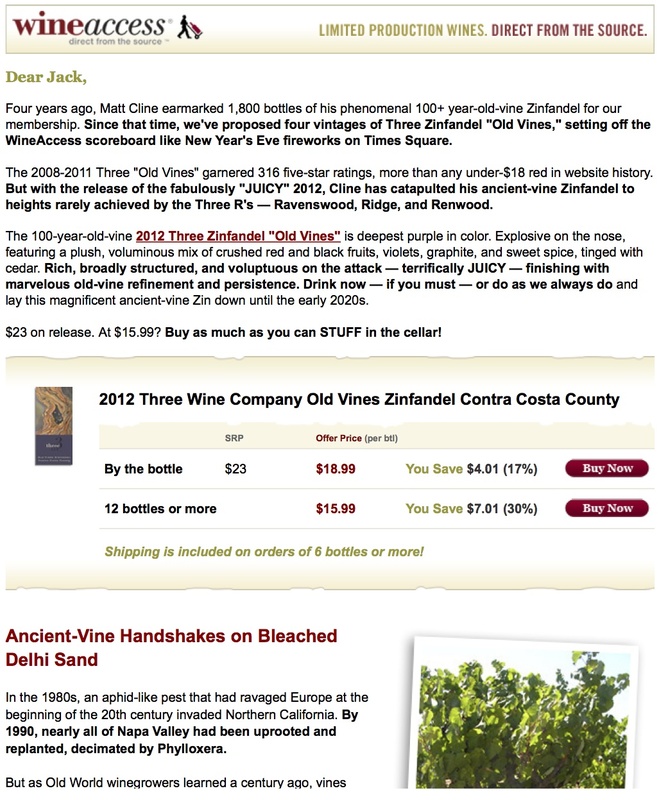 It’s worth getting on their e-mail list, just for the regular info on CA’s oldest vines. *The liquor laws are different in every state and change frequently. Check the site to see if they can ship to your state (today). Vitis.com – Vitis is the flash sale extension arm of a brick and mortar shop in New York (not The City). They’ve got a couple of fancy MWs making their selections and offer reviews, technical specs, aging potential, cheese pairings, and a suggested recipe for each and every bottle; with a slightly weighted specialty in the Italian direction. It’s a visually attractive site with solid info and little clutter. Every deal I’ve bothered to corroborate has been the best available price in the country. *The liquor laws are different in every state and change frequently. Check the site to see if they can ship to your state (today). WTSO.com – WinesTillSoldOut is the original version of the Vitis model and they move more units, but their content is far less compelling, and visually, it’s as boxy and unappealing as an ’86 Volvo. While they seem have to long since settled into a groove, where long time users have noticed that they seem to run many of the same labels vintage after vintage, their marathon sales can yield some decent scores, if you have all day to continuously refresh and pull the trigger at just the right moment, avoiding the Whammies. *The liquor laws are different in every state and change frequently. Check the site to see if they can ship to your state (today). CinderellawWine.com – CinerellaWine is an extension of WineLibrary in NJ, and whatever you buy from Cinderella gets dumped directly into a shopping cart of said long time margin squeezing retailer. Both operations were grown by the infuriatingly ra-ra Jets fan that is Gary Vaynerchuk, but he’s since run off to be some kind of a motivational speaker and half-assed author that really gets the juices flowing of state school communications majors in fly-over regions across the county. *The liquor laws are different in every state and change frequently. Check the site to see if they can ship to your state (today). 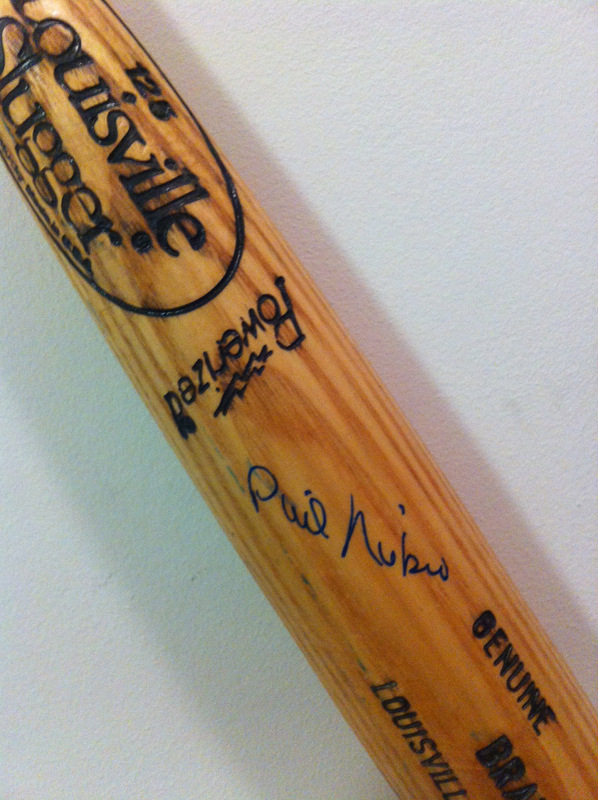 A cracked spring training bat signed by then pitching coach Phil Niekro. Two weeks into the new year and I’m already 12 days (and five years) behind on my resolution(s). Back to life… back to reality. Well, if reality were a pile of rare wine and 46oz axe handle ribeyes. I’m so scattered that I’m quoting Soul II Soul, but I digress… from my digression. Red meat & red wine is just one of those (combination of) things, right up there with the all-time greats. 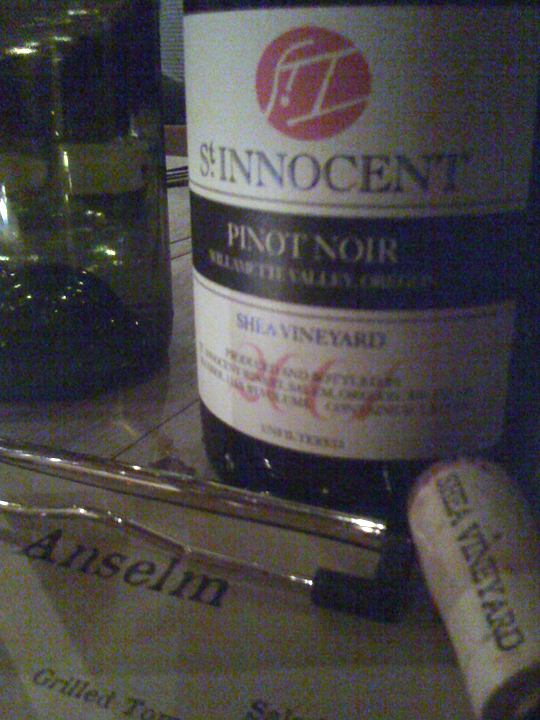 And while a number of interesting and beautiful reds (and one white- Wind Gap Trousseau Gris 2011) were sipped over succulent charred animal flesh at St. Anselm, it is the St Innocent Pinot Noir Shea Vineyard 2001 that most warrants documentation. St. Innocent is one of those great American owner/winemaker situations, where proprietor Mark Vlossak makes some of Oregon’s most compelling (single vineyard) bottled produce. The hardiest examples from the stronger vintages defy the absurd common wisdom that American Pinot Noir doesn’t age well. And the finest expressions of Shea vineyard grapes age as well as any American Pinot Noir; far greater longevity than a francophile will ever admit. And this one is fairly interesting, over a decade after crush. 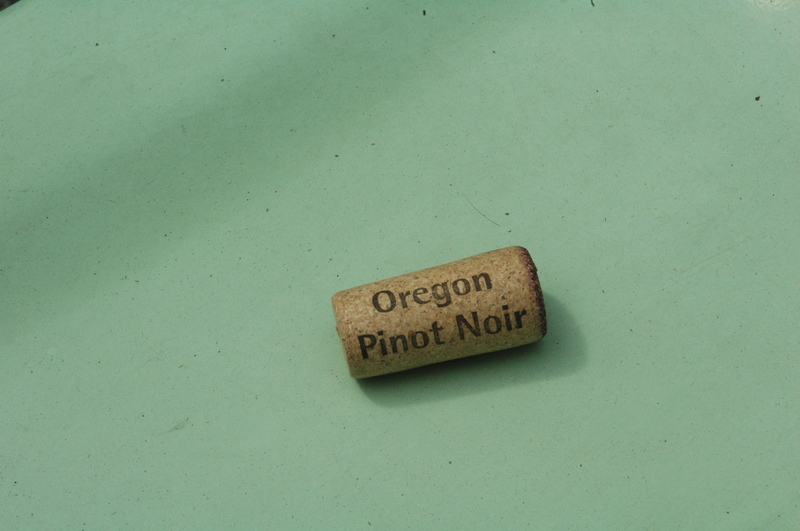 What was that about American Pinot not aging well again? So, I finally watched Knuckleball, which reminded me acutely that baseball was my first love, well before wine, or even women. If you have ever loved anything about any sport that wasn’t based in some re-wired tribalism, Knuckleball will warm the cockles of your heart. Didn’t know that R.A. Dickey was a born again Christian, but one of many reasons I stopped following organized sports was that I didn’t want to support the livelihood of thugs and felons. So, like saddling up to an Irish bar, let’s leave the religion and politics at the door (for today). But if I find out that Charlie Hough, The Niekro brothers, and Tim Wakefield are all born again, and that only by taking the New Tastament version of Jesus Christ Superstar into one’s heart, can you truly take the spin off of that demoniacle changeup, I’ll be very upset. Regardless, if I do follow baseball this season, it’ll likely be the Blue Jays that interest me. May the force be with you, R.A.
Back to the wine: St. Innocent Pinot Noir Shea Vineyard 2001 is showing slightly less fruit than previous tastings, but no less expansive baseline of furry dry raspberry, brambly, but thornless, and a lesser presence of red cherry. There’s a broad mid-palate of dusty crushed granite, dry earth, pine tar, ancient cedar chips, and just a touch of gaminess. With further breath the mid-palate opens to palate-suckingly dry, before a deceptively long, undulating finish. It’s beautiful stuff, but have a large glass of clear cool water handy. Always remember: Hydration is your friend. It makes tomorrow possible. From the weight and breadth of the St. Innocent Pinot Noir Shea Vineyard 2001, it’s difficult to discern how much life this wine has left in it, but it’s well worth pairing with a well-marbled world-class steak today. Another Tasting Night at Apiary – What day is this… man? A testament to OR fruit, traditional winemaking, and proper cellaring. [It was] another Monday night at the bar at Apiary and the place is buzzing; not bad for August [yeah, that’s how far behind on tasting notes I am!]. By request, I’ve brought nothing but whites: one long shot, a probable, and a couple of sure things. 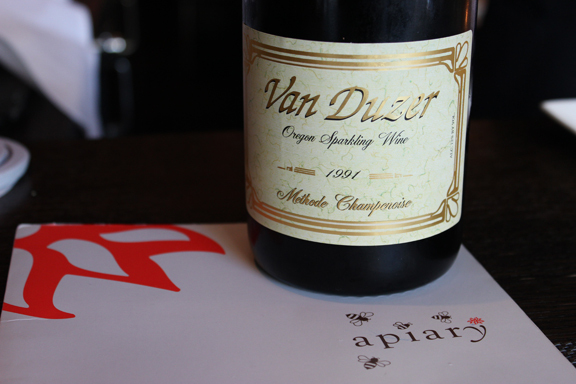 First, the long shot: Van Duzer Oregon Sparkling Wine Methode Champenoise 1991. I bought this wine for basically nothing at all, from an unverified source, assuming– like the seller- that this wine was likely well beyond its pleasurable drinking window. That being said, 1991 has proven to be one of the longest lived vintages ever for most OR wines that have been around that long, and Van Duzer bottles some high art, on their best days. * And I know I’ve said it 1,000 times before, but it bears repeating that Chef Scott Bryan of Apiary (formerly of Veritas) puts out- every night- some of the best, wine friendliest, food that has ever existed on this vile rock they call Manhattan. While unanimously declared a tough act to follow, the hesitating beauty to my right, Roy (Apiary’s Wine Guru), and I moved on to the Vincent Girardin Chassagne Montrachet Le Cailleret 1999. I can’t overstate how universally fantastic and underrated world wine is from 1999. It’s a solid- if not classic- vintage in many major wine regions from the Rogue Valley to Ribera del Duero, and represents many of the last “bargains” from overpriced earth, like that of Bordeaux and Burgundy. 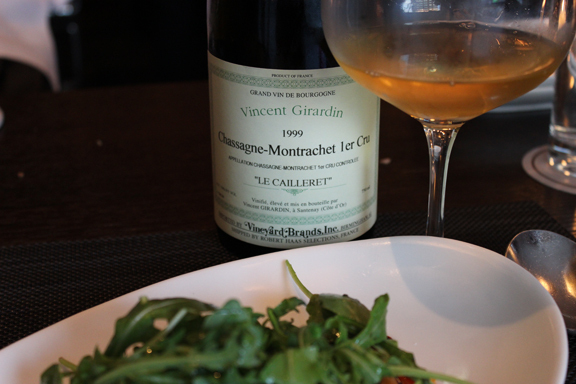 In the glass the the Girardin Chassagne Montrachet Le Cailleret ’99 is as much caramel as gold, though the pictured softness is condensation on the glass, not the telltale cloud of oxidation. The nose is ripe with a damp earthy funk over a building tide of increasingly prevalent salt air. The palate is soft and integrated, with a citrus spike, punctuated by a flutter of honeybell rind, dancing about a tight mineral core. I would love to blind taste this one on a roomful of Burgundy snobs who scoff at such negociant wines. 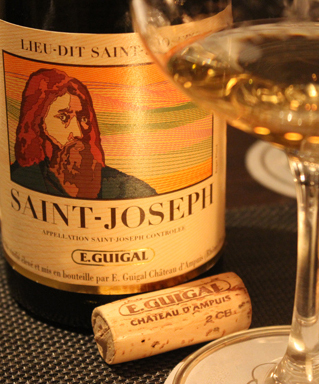 It would be dishonest of me to give full tasting notes on this Guigal St Joseph Lieu Dit 2007 as I can’t locate my notes on the matter. But I do have a small list of bullets from Roy: “apple, papaya, lychee, white river stones, limestone, calcium- medium long finish, med+ weight.” The wine was quite beautiful and deserves a more considered review, but the above list represents the only primary resource I have from that evening. Calera had, reasonably quietly, been making one of the finest inexpensive Pinots in CA, until this vintage, when some Italian dude stamped it with 92 points and told one of the largest wine buying audiences in the world that Calera Pinot Noir Central Coast 2009 “may very well be the single finest value in American Pinot Noir.” And it’s definitely up there. I know Calera’s single vineyard Pinots are renowned wines of fine character and notable longevity (I am cellaring a number of them), but at $65+ for Jensen and Selleck Vineyard bottles, the opportunity cost is substantial. If you’re planning to drop $70 on a bottle of wine, the options for greatness are many, unless you only drink Burgundy, and then I kinda feel sorry for your limited options and your dainty palate (and your wallet). 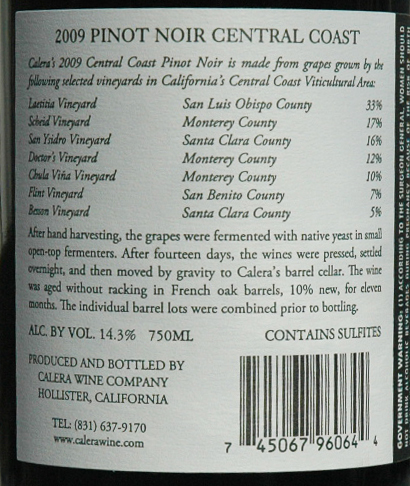 But Calera’s introductory level offering is unparalleled, at the $19.99/btl I recently paid at retail. And while I can’t speak to the longevity of the pretty glass ‘cork’, I can say that a 1997 vintage of the same wine (enclosed with traditional cork) showed beautifully not 2 years ago. Searching the YouTube for a specific Jill Sobule show, I find a number of earnest young girls covering her delightfully crushing “Mexican Wrestler,” which warms my black little heart. But who the hell is Emma Roberts and why do these little chicks think she wrote Jill’s awesome song?! Apparently, that’s Nickelodeon’s fault. Roberts’ (or her producer’s) lyrical changes unforgivably replace fleeting subtleties with sophomoric hyperbole, for the intended target market. Though I get why it would lack rational continuity if a teenager reminisced fondly being 21. I hope Jill at least got a decent royalty check out of the deal. And no lyrical rearrangement could be as disappointing as finding out that Katy Perry’s single “I Kissed A Girl”, about which I had heard upon release, was not a cover of Jill’s 1995 hit single at all. After that and Perry’s “California Gurls” (no relation to the Beach Boys tune), it quickly became clear what borrowed name recognition and a little t&a could do for one’s profile. But in the end Katy Perry is just tabloid trash and Jill Sobule is a lifelong storyteller, high up in the storied pantheon of New York’s singer/songwriters (and higher up in my personal pantheon). True she’s done some time in LA, but Jill Sobule and New York belong to each other. By the way, this is the performance I had been looking for: La Java, Paris 3/16/2010. Enjoy. 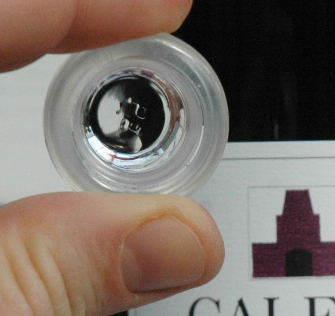 But back to Calera Pinot Noir 2009, and it’s unusual glass cap: The seal is good, and the capsule tight enough and difficult enough to remove so as to appear structurally sound enough to age, under proper climate control. That being said, I have now had a number of bottles of this wonderfully under-priced pinot, and I have found greater bottle variation than I would expect. I haven’t come across any vinegar or identifiable oxidation, but some bottles have shown more predominant red fruit than others where an earthy wet funk (just shy of swampy) persists, so much so that I’m hesitant to give specific tasting notes on this one. This is all the more curious for the amount that I enjoyed each bottle, regardless of variations. It’s a good reminder though how much bottle variation does exist and that all tasting notes are just one persons opinion of one bottle’s opinion of any wine, in a given moment. The most common thread between each tasting of Calera Pinot Noir Central Coast 2009 is bright, but substantial and gripping, red cherry, which was immediately reminiscent of a recently tasted bottle of Laetitia Pinot Noir. No surprise, said vineyard was the source of over 30% of the fruit for this regional blend. So, I’ve drunk through the bottles that I’ve allowed myself (really not much beats this one at $20), but I did manage to squirrel some away. I’ll be checking back in on the progress of the wine and the medium-term stability of its all glass seal. 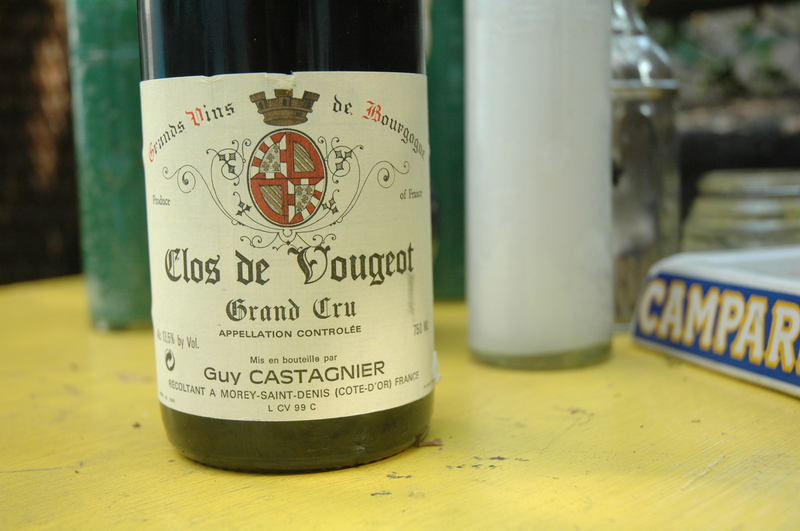 Digging into the depths of the 144-bottle wine fridge in the corner of my kitchen, I discover a slightly tattered bottle of Castagnier Clos Vougeot 1999. 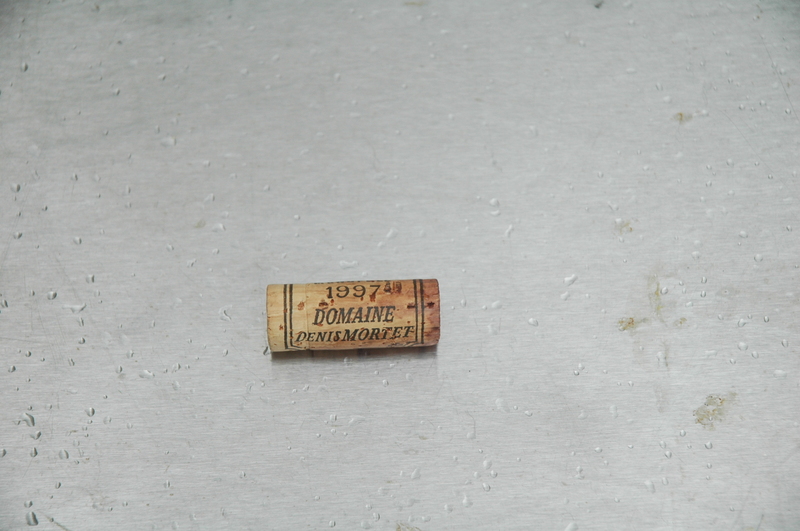 As small as the total grape-growing real estate is in Burgundy, there are so many subdivided plots (mostly through lineage succession) that many tiny producers bottle very nice wine, almost completely unnoticed by the outside world. I’ll often take a chance on unknown Burgundy at an attractive price. In a nice vintage, such as 1999, not too many bad grapes were grown in Vougeot, in Echezeaux, in Bonne Mares. And with yields so tiny, very little fruit falls into inept hands. I’m having a deep mid-90s (pop)rock chick moment as I am listening to the debut self-titled album by Marry Me Jane (1996). The opening forlorn electric guitar of “Twentyone” reminds me that this album was appropriated quite extensively- to great effect- in the little known (but great, for a RomCom) Eric Schaeffer film, If Lucy Fell. Elle MacPherson is surprisingly good (and unreasonably attractive), Sarah Jessica Parker is her old pre Jimmy Choo charming, and Ben Stiller’s small but unrelentingly absurd character roll is worth the price of admission. But back to Marry Me Jane which was a 2-record band, largely a vehicle for the songs of Amanda Kravat, who according to IMDB logged a fistful of composing, acting, and soundtrack credits between ’96 and ’01, before disappearing into the ether. The Castagnier Clos Vougeot 1999 does not disappoint, at its price, and Vougeot has gotten disproportionately pricey, even amongst Burgundy. The color and palate are both bright, but deep (red) cherry. There’s an earthiness on nose and palate, but without any of that typical Burgundy funk. The ’99 Castagnier Vougeot is medium bodied, if a touch unchallenging, but sweet with cherry with wisps of fresh mint and a palate smackingly dry finish. The alcohol is a little more prevalent than was expected, but the acid and the fruit hold it all together. In a blind tasting, one might mistake this Vougeot for a Griotte Chambertin, twice its age. I had only recently stumbled upon and found significant fascination in the Burgundy of Denis Mortet when I heard the news that he had taken his own life, early in 2006. It was his ’96-’98 Gevrey Chambertin Lavaux St. Jacques which first struck my palate’s interest. I had ordered but not yet received a parcel of his Gevrey Chambertin from the mid ‘90s and upon the news, I snapped up what else I could. To experience the wine of a deceased master is a glorious indulgence, finite and fleeting. It’s both a celebration of life and an acknowledgement of loss and of mortality, and I afford great respect to bottles from winemakers like Denis Mortet, David Lett (The Eyrie Vineyards), and Alois Kracher. All that Nico, John Cale, Lou Reed, and Velvets en masse, that has been injected into my now through the grace of David Byrne Radio, got me seeking out other semi-related cool tracks. After pulling up Nico’s cover of “These Days,” which was so artfully appropriated by Wes Anderson for the soundtrack of The Royal Tenenbaums, I found other thoughtful renditions of the same. While I knew that tune was originally by Jackson Browne, I didn’t know that he wrote it when he was 16, until he told me. Then YouTube informed me that Elliott Smith (2nd Tenenbaums soundtrack connection) also covered that track live, which thankfully some nerd posted, and I also came across a pretty and breathy version by St. Vincent. But as YouTube giveth, YouTube also taketh away. Apparently, the Foo Fighters, Bon Jovi, Nate Dogg, Alien Ant Farm, and Rascal Flatts have all recorded “songs” with the same title as (but otherwise unrelated to) the Jackson Browne classic, each one more soul crushingly worthless than the last. 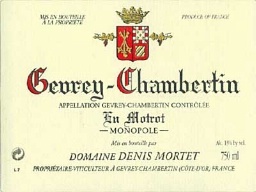 The Denis Mortet Gevrey Chambertin en Motrot 1997 is bright, though softening, translucent ruby in the glass, and there’s just a touch of sedimentary cloud to the color, but no signs of oxidation. The first waft is of an earthy, flirting with swampy, funk, though the latter begins to wane with air. The palate is of dry raspberry, subtle tart cherry, leather and ancient cigar tobacco. This is a refined medium-bodied pinot and there is a greater overall presence and depth here than has been found in other recent lithe ’97 Burgundies. As the swamp dries up, damp fall leaves remain, and an encompassing, but not overwhelming dryness approaches the palate. And the last glass is raised to the memory and fruits of a tormented master. Having no excuse to open anything grand (cru), I go to the tasty cheapy shelves and pull, to taste, a Cloudline Pinot Noir Willamette Valley 2008, for which I paid about $15. 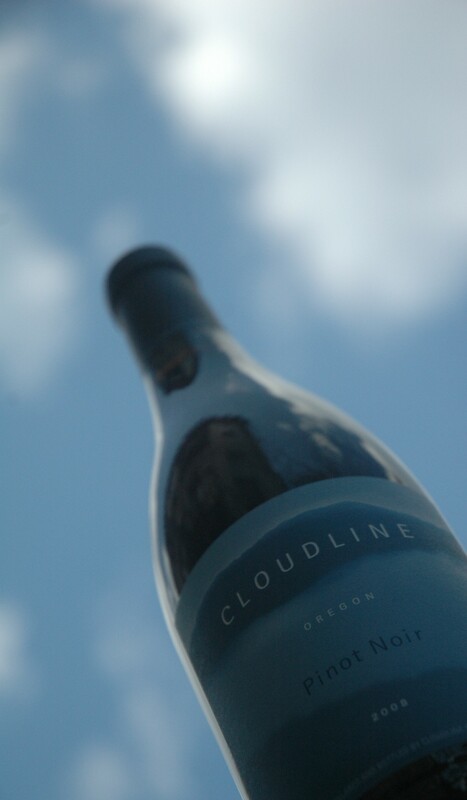 Cloudline is a nogociant wine, sourced from a variety of Oregon vineyards, whose large production is guided by consulting winemaker Veronique Drouhin-Boss. Veronique is the great-granddaughter of Joseph Drouhin, who began making wine in Cote de Beaune in 1880, and founded the family label under which many a beautiful Burgundy is still bottled today. I believe I can fly. I’m listening to Brooklyn-based Tim Fite’s “Big Mistake” off of his Fair Ain’t Fair album. Fite is one of those rare artists who chooses specific musical moments for which his individual projects to exist, rather than blending his scope of influence into a single songwriting sound. His live show is a one-man multi-media experience that features story-telling, hand drawn animated videos, and songs in which Fite plays, loops, and sings along with back-up players and singers on a video screen, each of whom is also Tim Fite. He’s a strange and unusual artist, in the best way(s), and his sincerity is undeniable. “Big Mistake” best demonstrates his outsider charm, as pulled snug over a deeply nuanced musicality and intellectual lyrical sensibility. Tim Fite is superhuman; check him out. In the glass, the Cloudline Pinot Noir 2008 is medium ruby and medium bodied. The nose is somewhat muted, and initially blanketed by alcohol, but not enough to obscure the bright red fruit that also makes up the most pleasurable facet of the palate. Along with which passes lighter notes of damp earth, ash, and wintergreen. After about 35 minutes of breathing time, the alcohol blows off the nose, which remains muted, but much softer, more inviting. By this time the palate is more integrated and has softened considerably, becoming light/medium bodied and dangerously gulpable. But now there’s a tangible minerality, leaning just a hair toward the metallic, a crisp acidity, and broadness of mouthfeel that keep this wine from being a pushover. For its price ($15-20) and its relative ubiquity, this is a solid (value) summertime Pinot which lends itself to versatile food/flavor pairing. If your local shop still has the 2008 vintage, it’s most definitely worth a taste (or a case).